Welcome to EnProwess blogs. In this post, I am going to talk about notification feature and how to create custom notification in DXP. Before we talk about notification feature in DXP, lets understand what has changed in DXP with compare to Liferay 6.2. There is Notification display portlet. This portlet can be used to display notification to all or specific user in portal. Notification display portlet is also embedder in docbar to display number of notification waiting for user. XML configuration required to define custom notifications class, notification definition etc. Notification display portlet is no longer available. Notification displays in control panel and docbar. Liferay 7 must be installed. Following are the steps to implement custom notification. To create Liferay modules, Click File menu → Click New → Select Liferay Module Project. Provide appropriate name for module and click finish. Create SendNotificationToUserHandler class and extends BaseUserNotificationHandler abstract class. 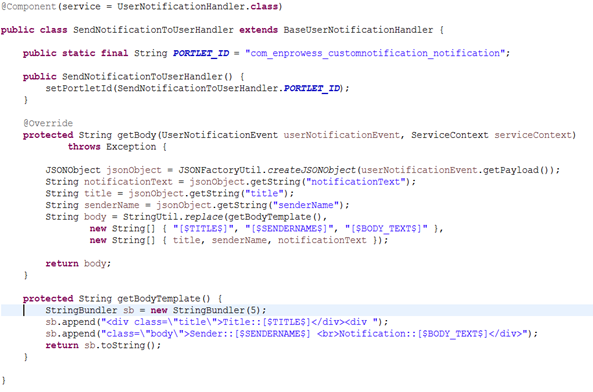 UserNotificationHandler‘s job is to interpret notification events and determine to whom to deliver it. For ex. To which user and site etc. You have successfully implemented custom notification class. Now its time to make notification entry in DB. Generally, this entry would be done from custom portlet based on business requirement to notify user about different events. Just to demonstrate how it works, I am adding one dummy entry in usernotificationevent table. I hope this post gives idea about difference between Liferay6.2 and DXP to implement custom notification. EnProwess believed in learning and sharing. You can read different implementation approaches for DXP on our site. Keep learning! 19 Comments on "Learn Liferay DXP custom notification in 5 minute"
Can you please send the github link for this demo code ? Thank you for your comment, It is not in github. You may share your email id with us at (info@enprowess.com) and we would be happy to share code bundle with you. Thank you for visting the blog and comment. Please check if there is any exception. If you can share more details(like key code block and feature where you have implemented this), it will help me to understand the issue. Further to this, I can share the code bundle (explained in this blog) with you if you can share your email-id. Thank you for your comment, Please share your email id with us at (info@enprowess.com) and we would be happy to share code bundle with you. Hi, I have followed all the above listed instructions and created a module to show custom notifications. Its creating a record in usernotificationevent table but neither it shows the count nor the notification. Could you please help me out by sharing the the code bundle explained in this blog ? Thanks in advance! Are you getting any exception? or any warning in tomcat log? If you can share more detail, I would surely try to help you further. Also, You may share your email id with us at (info@enprowess.com) and we would be happy to share code bundle with you. Source code is sent to your email id. Hi, can you share your code please, my email is trash6x@gmail.com, thank you. Source code is sent to your email address. Hope it helps. Thanks for your post. It’s really useful. Could you please share your code. my email is lonelyemerald@gmail.com.